Belize is so much more than beautiful beaches. Belize boasts the second largest barrier reef in the world, ancient Mayan ruins, jungles and wildlife reserves. There's no shortage of adventure options, but we have a few recommendations! The Belize Barrier Reef Reserve System lies off the eastern coast of Belize and is the longest barrier reef in the Western Hemisphere and the second longest in the world. Belize Underwater hosts incredible scuba diving and snorkeling in the best dive sites in the country. Visit the Blue Hole, South Water Caye, Glover's Atoll, or Turneffe Island. Not certified? We also offer PADI Courses and Discover SCUBA, where you spend a few hours learning to dive, then you go on a real SCUBA dive, all in one day! Go fly fishing with guides at Blue Horizon, an Orvis Endorsed Outfitter. Try your hand at a grand slam and hook a permit, tarpon and bonefish on the same day. Half day and full day tours offered. If you've never fly fished before, don't worry! Blue Horizon guides are happy to teach you. 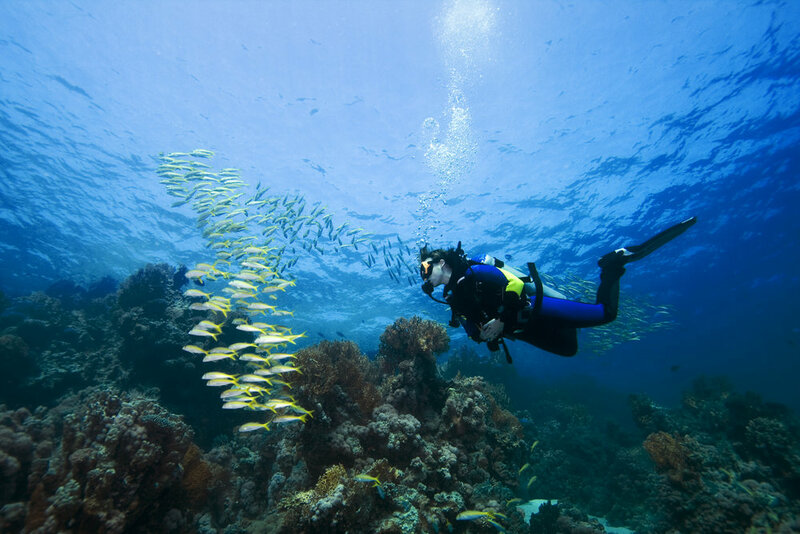 Picture your group anchored out on the second largest barrier reef in the world catching a variety of ocean species. All fishing gear and refreshments (soda, water and ice) and a lunch are included. Whether you prefer trolling along the outer cayes or spin casting anywhere along the coast you will get to experience it all. The fishing guides are equipped with rods and tackle. Full day experience includes going to the island and cooking your catch! For a small plating fee, Hopkins Bay Belize will cook your catch for you. A day at Thatch Caye Resort is an unforgettable experience. We cater to travelers who are looking for an off the beaten path paradise with a fun, community vibe. Whether your utopia includes adventure on the open water or sun, sand and drinks, you'll be right at home at Thatch Caye. We're a friendly island that welcomes boaters and yacht moorings. From the Coco Lounge to the Starfish Bar, you'll see that this island is a true destination. Our private island resort has everything you'll want and more. Take a ride on the dive boat and get dropped off at Thatch Caye Resort. Spend the morning (8 am to 1 pm) enjoying Thatch Caye's facilities. Enjoy zip lining through the dense jungle and enjoy a true rainforest experience with some of the most experienced zip line guides in Belize. Soar with the birds on the longest zip line course in Belize and Central America through the pristine canopy of the jungle. After zipping on the longest zip line in Belize, fill up with a delicious lunch. You will then venture on a guided hike to the waterfall where you rappel one hundred feet down. World renowned for being the first jaguar reserve with over 128,000 acres of lush tropical rain forest. Explore the jungle trails of this flora & fauna sanctuary with a naturalist tour guide, home to all five of Belize’s cats: Jaguar, Puma, Margay, Jaguarundi, and Ocelot. After your hike, tube-float down the South Stann Creek for a unique close-up look at the jungle and then take a short hike to the waterfall for a cool dip to conclude your visit. Afterwards enjoy a short picnic lunch before heading back. Ideal for both experienced and non-experienced riders. Leaving from Outback Stables, guests will pass through a citrus grove before entering into the hills that surrounded the Maya Mountains. The trail winds over Pine Forest Hills with beautiful views of the second highest peak in Belize. The trail makes its way over mounds of rock that are the remains of an ancient Maya Civilization until you reach the bank of the Sittee River. Take a break and a swim before hitting the trail again. Visit a traditional Mayan family operation led by Julio Sacqui, a master chocolate maker who offers two-hour farm-to-factory tours including a trip to the cacao plantation. The full process is explained right through to the finished bar of dark chocolate.